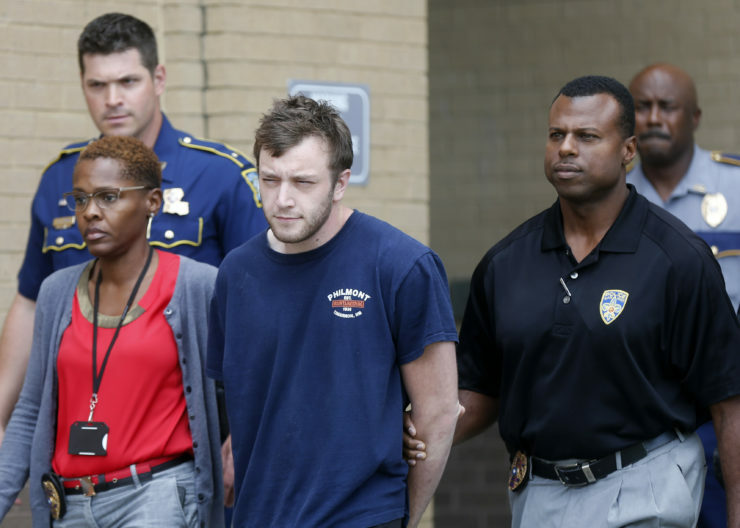 Kenneth Gleason (center) is escorted by police to a waiting squad car in Baton Rouge, La. He has been accused of killing two black men in seemingly random attacks. In this week’s Hate Report: Studies show a continued increase in hate crimes nationwide and suggest many Americans might hold white supremacist views without even knowing it; a far-right social media site struggles for survival; and a shocking look inside the alt-right. Once again, a young white man has been accused of killing African Americans in seemingly random slayings. Kenneth Gleason, a 23-year-old from Baton Rouge, Louisiana, was taken into custody Tuesday, accused of fatally shooting two black men in separate attacks earlier this month. He’s also accused of firing at the home of a black family in his neighborhood. From his car, Gleason is accused of shooting Bruce Cofield, a local homeless man, and Donald Smart, an employee at a local cafe, then getting out of his car and firing several more shots into the men. Police said Gleason didn’t know the victims and raised the possibility that the killings were motivated by racial hatred. A police source told the Associated Press on Tuesday that a copy of a speech by Adolf Hitler was found in Gleason’s home. There have been at least two other killings by white men seemingly sparked by racial hatred this year. In February, Adam Purinton allegedly shot three men, including two Indian immigrants, in a bar in Olathe, Kansas, after ranting about the Indian men’s immigration status. One man died in the attack, and Purinton has been charged with a federal hate crime. In May, Jeremy Christian, a 35-year-old from Portland, Oregon, was accused of stabbing three people, killing two, in an attack on a commuter train. The attack started after the men came to the aid of two young Muslim women Christian had been verbally abusing. These four fatal attacks are the most prominent of the racially motivated violent crimes across the United States over the past year, many of which we have detailed in The Hate Report. Two other recent examples: Last week, prosecutors filed federal hate crime charges against Mark Porter, a 58-year-old white man from Utah, who is accused of shouting racial abuse at a father and his 7-year-old son before stunning the father with a stun cane. In late August, 24-year-old Pennsylvania resident Gregory Brzoza was arrested and accused of a racially motivated hate crime in Cleveland after he shouted at a young man to “go back to your own country,” then punched him, knocking him unconscious when his head hit the ground. Hate crimes in America rose about 5 percent from 2015 to 2016, according to a closely watched study by the Center for the Study of Hate and Extremism at California State University, San Bernardino. Of the nation’s five largest cities, all but Houston experienced double-digit percentage increases, (study author and professor Brian) Levin said. A Reuters/Ipsos poll done with the University of Virginia Center for Politics reveals a contradiction within the American populace: The majority of Americans oppose the actions of white supremacists, but a large subset of the population nevertheless agrees with many of the views such groups espouse. These are two of the main talking points used by the leaders of the white supremacist movement. Where will the far right gab when they can’t go on Gab? Recent weeks have seen a push by tech companies to cut off services to far-right websites. The neo-Nazi site Stormfront had its domain revoked, leading to the long-running site disappearing from the internet. White supremacist site The Daily Stormer similarly saw one domain registrar after another terminate its contract, forcing it to bounce around to different registrars until it landed an Icelandic .is domain. The most recent high-profile case is the social network Gab, which has become popular with far-right figures, many of whom have been booted from social networks such as Twitter for hate speech. The site’s mobile app recently was removed from Google’s Play store for violating the company’s terms of service on hate speech grounds. But Gab isn’t going down without a fight. The Austin, Texas-based firm is filing an anti-trust lawsuit against Google. The battle between far-right hubs such as Gab and established tech giants such as Google reveals a fundamental paradox in the architecture of the internet: It has allowed more people than ever to make their voices heard, but the infrastructure used to do that is privately owned. A few companies have broad leeway in shutting down speech they see as incompatible with their values. To understand the dangers of this, take it from one tech CEO who booted The Daily Stormer from his service. His entire memo is worth a read. The last time far-right provocateur and former Breitbart News Editor Milo Yiannopoulos tried to hold an event in Berkeley, California, his speech was shut down by protesters, and rioters caused a reported $100,000 in damage to property. It was a seminal moment in the public showdowns that have been unfolding on streets across America between alt-right agitators and members of the anti-fascist movement, or the antifa. Now, Yiannopoulos is back. He’s holding a “Free Speech Week” from Sunday through Wednesday on the UC Berkeley campus, and the invited speakers are a who’s who of the far right and prime antifa targets. Included on the list are Steve Bannon, Breitbart chairman and former senior adviser to President Donald Trump; writer Ann Coulter; and Yiannopoulos himself. The university reportedly is ramping up security for the event, in expectation of violent clashes between far-right protesters and their antifa rivals. But local antifa activist John Cookenboo told us that he expects the week to be largely uneventful. “I think there will be some action, likely on the final day of the speakers,” Cookenboo said. Be sure to check out the latest Reveal episode when it drops Saturday for an in-depth exploration of the culture and violence that have built up around these free speech provocations. The New York Times published an astonishing inside look at the alt-right Tuesday that revealed some remarkable insights into the movement. The story outlined the work of Patrik Hermansson, a 25-year-old graduate student from Sweden, who went undercover for a year as part of his work with the British anti-racist watchdog group Hope Not Hate. Hermansson secretly filmed some of the most controversial figures in the far-right movement, and he caught them saying some pretty disturbing things. For example, Greg Johnson, a far-right publisher, told Hermansson that Jews in America needed to be sent to Israel. He also suggested offering reduced sentences to criminals who underwent voluntary sterilization. Perhaps the most insightful part of Hermansson’s work, and The New York Times’ story, is the coverage of Jason Reza Jorjani, who co-founded the AltRight Corporation with noted white supremacist Richard Spencer. In a secretly filmed interview at an Irish bar, Jorjani said Europe would one day celebrate Hitler by having his face on a banknote. Hitler will be seen as a “great European leader,” he said, and “not like some weird monster.” Jorjani then went on to brag of his group’s connections to the White House. The White House said it had no knowledge of any such contact. And with Bannon and other far-right figures out of the administration, Jorjani recently quit the AltRight Corporation. He told the Times that the alt-right’s attempts to win over the White House were a failure. Correction: An earlier version of this story had an incorrect date for the shooting in Olathe, Kansas. It occurred in February 2017.